With its debt problems gone, Cardno is set to prosper again. The Australian Fund’s latest investment isn’t a typical old media company. The turmoil of the past 12 months has translated into excellent returns for both funds. Long may it continue. If Billy Joel rewrites his 1989 classic We Didn’t Start the Fire, 2016 will surely get its own verse. From January’s China meltdown worries through to a US president elect pursuing government policy via Twitter, hardly a month went past without something extraordinary happening. Truth be told, we didn’t predict any of it. We didn’t know who was going to win what and we didn’t place any huge bets on the outcomes of elections, referendums or currency movements. And yet, 2016 was one of our best ever years of relative performance. 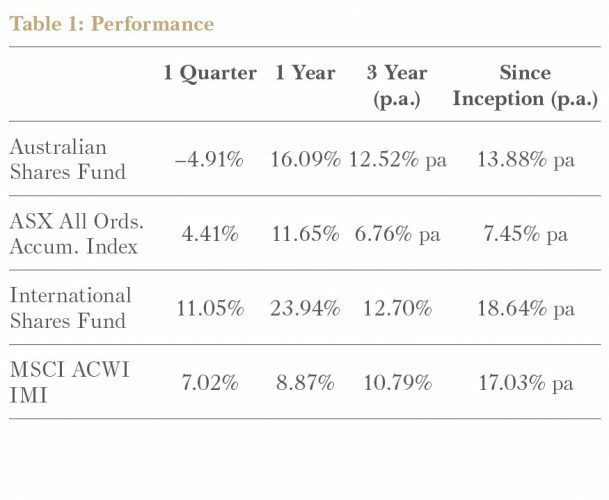 Despite some disappointing developments in the last three months of the year, the Australian Fund added 16% of performance for the year, 4.5% ahead of the All Ordinaries Accumulation Index. Despite being down 5% in the first month of the year, the International Fund finished up 24%, versus 9% for its MSCI global index. * Performance is as at 31 December 2016. 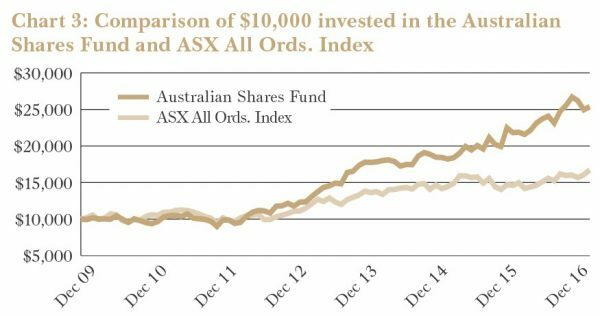 Australian Shares Fund inception date 13 Octover 2009, International Shares Fund inception date 8 February 2013. Investments can go up and down. Past Performance is not necessarily indicative of future performance. Perhaps it was a year where knowing nothing was an advantage. Perhaps lady luck blessed us with good fortune throughout the year. But 2016 provides a few useful insights into the Forager investment approach. I am at best a mediocre chess player. But I enjoy the game and enjoy observing those who are good at it. One of the insights that helped me as an investor was recognising that the best chess players aren’t as visionary as most people think. The idea has been perpetuated that you need to be able to see 20 moves into the future to be a grand master. Yet ask the good players why they made a particular move and, most of the time, they will tell you they are simply trying to occupy a strategic part of the board. They want to get their pieces into positions where they are, firstly, protected and, secondly, can make as many future moves as possible. Towards the end of a game they might force their opponent to make certain moves and therefore can think several moves ahead. But in the early and middle parts of the game, there is no knowing what the opposition will do. The key is to get into a position where all potential moves can be countered, and poor ones can be punished. This philosophy underpins our entire investing approach. We don’t know what is going to happen in the world. We don’t know how the market will react. So we prepare our portfolios such that they are robust to a wide range of potential outcomes. This means holding appropriate amounts of cash and ensuring we don’t have too much exposure to any one company, industry, sector or country. “I am not someone who invests on the basis of expectations for the future … When you react to what actually happens rather than guess about what might happen, I think you make less mistakes”. Lots of events, then, means lots of things to react to. Which goes some way towards explaining why 2016 was such a good year. A healthy chunk of the returns in both portfolios came from stocks we didn’t own at the start of the year or ones where we added to the investment as share prices tumbled. By the end of the year miner South32 had tripled from its January lows (held by both portfolios). We only began purchasing international holding El.En. in January but it more than doubled. 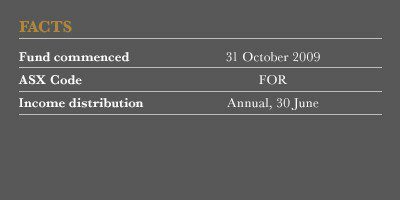 And a post-Brexit addition, London listed JRP Group (see below), had rebounded 20% by Christmas. It was our reactions that generated profits, not our predictions. The big difference with chess is that the investing game never ends. The board is like a slow moving treadmill that is going to roll on forever. You occasionally get opportunities to make big, game changing moves but you never achieve a checkmate. Each win is followed by a period of consolidation, where we go back to occupying those strategic positions on the board. As we roll into 2017, it feels like such a time. Surveying the investing landscape, there are not a lot of opportunities for bold and decisive investing decisions. We think there is still plenty of money to be made in the oil sector (see below). There are a number of individual stocks which look attractively priced. But most sectors and asset classes look somewhere between fair value and expensive. We have no more idea what is going to happen this year than we did last. Marine le Pen may win the French Presidential election. The Italian banking system might collapse. Donald Trump might spark a global trade war. He may well start a human one. Or none of these things might happen. Where other investors fear “uncertainty”, however, you should welcome it. In uncertainty lies our opportunity. The more of it, the better. One place we are anticipating less turmoil is in the Forager office. We have achieved a lot over the past seven years but never as much as in 2016. Listing the Forager Australian Shares Fund (FASF) was a complicated and expensive project for a small business like ours. With minimal distraction for the investment team (yes, some would argue not involving us helps), FASF units starting trading on ASX just prior to Christmas. We now have the ideal structure for our long-term, contrarian investing. Trading in the units so far has been orderly and mostly at a small premium to net tangible assets. So far, listing the Fund has gone as well as we could have hoped. For that we have a few very talented people to thank, most notably Alexandra Larkman and Jeff Weeden. Forager is very fortunate to have a couple of brilliant managers running the business. While they may not be the first people you think about when investing, they are some of the most important. They allow us to get on with investing, recruit the right people to the company and attract the new investors that allow us to pay bills. Building a business that can survive and prosper beyond the life of its founder is a hurdle very few funds management companies manage to navigate. I’m under no illusions about how difficult the challenge will be for us. But the outstanding achievements of the past 12 months shows we have a few of the right people in place. Thank you for all of your hard work. Few predicted President Trump. Even fewer would have guessed at the post-election stockmarket rally. Our very cloudy crystal ball didn’t stop the Fund from having a great quarter and year. Confounding is the right word to describe the last quarter of 2016. For months leading up to the US election, every time Trump’s chances of victory appeared less remote, the market sold off in fear. And they rallied on any improvement in Clinton’s forecast lead. Pundits talked about stocks falling 10% or more if the orange one ascended to the throne. Paul Krugman bombastically suggested markets would never recover. Then, after Trump won unexpectedly? Markets around the globe ran off on some of their largest rallies in recent times. The S&P 500 is up more than 6% since election day. It’s a reminder of the undemocratic nature of markets — thousands of us can share one opinion but if Stan Druckenmiller or Carl Icahn think otherwise, they have the weight of money. The Italian constitutional referendum of 4 December was similarly surprising. Prior to the vote, a “No, grazie” vote was seen as a potential trigger for the end of the EU and perhaps Armageddon for its financial sector. The amendments to the constitution were voted down and … the country’s bellwether stockmarket index rallied 15% over the rest of the month. Of course, it hasn’t solved any of Italy’s banking issues long term. Nor short term, if emergency recapitalisation talks for Banca Monte dei Paschi are any guide. But it is a lesson on the futility of paying attention to forecasters. As you should know by now, we don’t position the portfolio for particular election outcomes, instead aiming for resilience in all environments. But the portfolio is well balanced and has benefited from the recent rally. Our larger US positions have done well in anticipation of a strong US economy and the likelihood of a tax reduction on foreign profit repatriations. Across the Atlantic, our numerous stakes in European exporters have benefited from a lower Euro currency. Rumblings in the oil market have also helped. When we first invested in the energy sector in 2013 we assumed that the Organization of Petroleum Exporting Countries (OPEC) could not afford to let oil prices fall. Government spending across most of the members of the cartel was heavily reliant on petroleum revenues. Any major fall in the oil price would result in massive deficits and increased economic instability, so our thinking went. So much for that. From 2014 on, OPEC proved not only willing but determined to precipitate a massive drop in the price of oil in a misguided attempt to punish North American land drillers. They probably hurt their own member countries as much as the roughnecks in North Dakota and Texas. In late November, OPEC finally announced that its members had agreed to cut crude oil production in order to boost global oil prices. As the largest crude oil producer within OPEC, Saudi Arabia is illustrative. Over the last two years, its economy has suffered badly from reduced oil revenues. After running a $100bn deficit in 2015, it has been forced to suddenly slash government salaries and perks this year. Two-thirds of working Saudi nationals are employed by the government, so the pain from the cutback has been especially acute. Throw in the increasing fiscal burdens from electricity and water subsidies, military funding for a war in Yemen and rampant unemployment. Its willingness to endure pain is, finally, waning. Two years into one of the worst contractions in the oil industry’s history, the same can be said for most OPEC nations. The cuts should have a meaningful impact on the flow of crude oil into the global market. Based on statistics and estimates from OPEC and the International Energy Agency, the group currently supplies 33.9 million barrels of oil per day representing 35% of the world’s total supply. It has agreed to reduce that to 32.5 million barrels, representing a 1.4% cut to global production. OPEC has also struck an agreement with non-OPEC oil producing countries such as Russia and Kazakhstan for an additional 0.5 million barrel cut. All together, the oil markets could see a 2% reduction in supply over the first half of 2017. While 2% may not sound like much, it constitutes a big change for a market typically knocked askew by changes of less than 1%. In 2015, a decidedly atypical year, supply exceeded demand by 1.6%. But conditions have improved. OPEC’s reductions alone should see oil consumption to begin to exceed supply. And barring a major global recession, oil consumption is expected to grow more than 1% in 2017. Put those numbers together, and you have a market poised to tip from glut to a deficit of more than 1.6 million barrels a day. Inventories of crude that have built up over the last two years might be depleted by the end of 2017. Of course, this all assumes everyone holds to their commitments. History suggests exercising caution. Members have tended to cheat in the past. The ultimate rebalancing of the oil market will also hinge on other factors such as the response from North American shale drillers. But there is no doubt that two years of massive spending cuts have weakened the pipeline of future oil production. The Fund is back roughly to breakeven on its oil investments over the past 3-4 years, and continues to own a portfolio of stocks that will benefit from a rising oil price. Spinoffs have proven a fertile hunting ground for the Fund. Previous standouts include Veripos and South32 (ASX: S32). Our most recent foray into spinoff territory yielded an investment in US industrial distribution company KLX Inc. (NasdaqGS: KLXI). KLX distributes specialty products used in the aerospace and energy industries. The company does not make these products; it acts strictly as a middleman. Its aerospace business, KLX Aerospace Solutions, is the most important part of the company and traces its roots back decades. The long-time CEO has built that business up over time through savvy deal-making and an eye for value. It buys over one million products from thousands of manufacturers around the world and sells them to companies that build and maintain commercial and military aircraft. Good, niche distribution businesses like KLX’s tend to be very difficult to replicate or displace because they offer something to both suppliers and end-customers. For suppliers, KLX represents a large buyer that enables them to run their manufacturing plants in the most efficient and economical manner. It also provides them access to all of the major buyers in the supply chain, something that would be difficult to achieve for smaller, no-name manufacturers. For KLX’s customers, KLX provides a single point of contact for all of their product needs. It delivers them in a timely fashion and at a much lower cost than the buyer could obtain going direct. We like a number of other attributes of this business as well. First, KLX embeds itself deeply within its customers‘ operations, often assuming control of their inventory management. Customers would find it a costly and tricky proposition to disentangle themselves from the distributor. KLX also owns the exclusive right to supply a large catalog of aviation parts made by industrial conglomerate Honeywell International. These parts are specifically designed into numerous aircraft systems making the contract very valuable. KLX Aerospace Solutions sells to two types of customers: those that build planes and those that repair them. In industry parlance, the former are known as OEMs (original equipment manufacturers) and the latter are known as aftermarket buyers. Aftermarket sales tend to be much more profitable than OEM sales. Unfortunately for the company, the mix of business has shifted away from aftermarket sales in recent years, pulling down profitability. Management believes that a recent wave of commercial aircraft manufactured and delivered to the airlines over the last five years will soon start to need mandatory maintenance, increasing the need for KLX’s products with aftermarket buyers. This trend should boost KLX’s profits over the coming years. Whereas KLX’s aerospace unit remains solidly profitable, its smaller energy business has been mired in the carnage of the oil and gas downturn. This segment distributes products to energy companies operating in North America and business has been terrible in recent years. While the short term will continue to be difficult, it should be one of the earliest beneficiaries of the eventual turn in the energy cycle. When the Fund purchased shares in KLX Inc., the value equation was tilted heavily in our favour. The market capitalisation undervalued the aerospace business on its own, with the energy business thrown in for free. When the Fund purchased shares in KLX Inc., the value equation was tilted heavily in our favour. The market capitalisation undervalued the aerospace business on its own, with the energy business thrown in for free. The stock price has risen more than 30% since our purchase yet continues to undervalue the company. It doesn’t seem like a great time to be buying UK financial services companies. The sector, for a long time a bastion of sleepy, easy profits, is under mounting pressure. Financial advisors are being forced to provide non-conflicted advice. Banks are paying out billions in fines for selling inappropriate products. And, heaven forbid, fund managers are being forced to slash their fees. 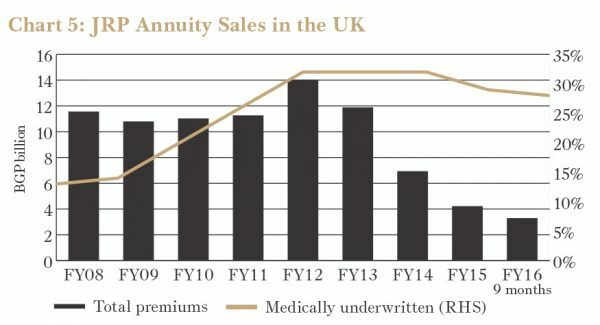 Facing increasing competition and regulatory scrutiny, annuity providers are no exception. But that hasn’t stopped us adding the UK’s largest medically underwritten annuity provider, JRP Group (LSE: JRP), to the portfolio. A lifetime annuity is a financial product that guarantees the purchaser a fixed return for the rest of their life. For example, a 70-year old with £100,000 to invest might earn something like £6,000 per annum on an annuity. Longevity risk – the chance of outliving your savings – is transferred to the annuity provider. The investor who only lives for 10 years loses out, whereas one who lives to 100 cashes in. Prior to 2015, members of defined-contribution pension schemes in the UK were forced to purchase an annuity on retirement. Most did so from their existing pension scheme provider, which made it an uncompetitive licence to print money. JRP was already challenging the status quo. Its expertise is the provision of medically underwritten annuities (MUAs). Instead of offering a set rate based on age and postcode, providers of MUAs take into account a raft of individual medical information before setting prices. This is one part of life where smoking, being overweight and having high cholesterol gets you the five star treatment — the lower your life expectancy, the higher the rate on your annuity. Able to offer up to 30% better prices to higher risk individuals, JRP and companies like it have been stealing the most attractive customers from traditional annuity providers for the past couple of decades. However, the whole industry was torpedoed by legislative changes last year. In 2015, the UK Government introduced legislation that forced pension providers to provide customers with a lot more choice on retirement. Retirees can still choose an annuity if they wish. But they are also now allowed to take a lump sum to do with as they please, or to purchase any one of a number of alternative financial products—it is these changes that have driven the huge increase in demand for software solutions from ASX-listed Bravura (ASX: BVS) and GBST (ASX: GBT). Demand for annuities plummeted. Then Brexit hit and interest rates plummeted too. JRP takes the upfront sum it receives from customers and invests it in relatively safe bonds and other fixed interest assets of a similar expected duration. Alongside life expectancy, the rates available on these assets are the main arbiter of the rates JRP can offer on its product. So lower rates mean less attractive returns offered to new annuity purchasers. The stockmarket assumed that meant less demand for annuities. So JRP’s already walloped share price was punished even further. When the share price fell to less than £1 in August this year, our interest was piqued. The company’s tangible book value is £1.53 per share. In a business where the management team can choose to return capital to shareholders if returns available are not adequate, we think at worst the business is worth book value. It also reports an embedded economic value of £2.27 per share. This metric adds to the book value the present value of future profits on business that has already been written. It’s a useful measure of what the business should be worth to an acquirer, and approximates our base case valuation. If the company continues to write profitable new business, it is worth even more. The share price reaction since June suggests that low interest rates are bad for business. We are yet to see evidence that this is the case. In fact, it is possible that low rates increase demand for annuities. Potential annuity purchasers become more exposed to longevity risk the lower the returns they earn on their assets (your capital is more likely to run out if you aren’t earning enough interest to fund your retirement). And we think a recent merger is overwhelmingly positive. JRP was known as Just Retirement until a recent combination with its largest rival, Partnership Group. The combined entity is expected to save some £45m per annum on costs. More importantly, it is likely to have improved pricing power. Management guidance suggests substantially improved margins for the second half (ended 31 December 2016). While reiterating that the scenario is not our base case, there is some chance this business is above average. The stock has bounced back to nearly £1.50 over recent months. Relative to our average purchase price of £1.08, today’s price doesn’t have the same margin of safety. We’re not in a hurry to sell, though, and will be watching that upside closely. During the quarter, the Fund sold out of Harley-Davidson (NYSE: HOG) and trimmed down some other positions — including South32 (ASX: S32), EL.EN. (BIT: ELN) and Halliburton (NYSE: HAL) as they moved closer to our estimate of fair value. We also added five new stocks to the portfolio. We’ll tell you about them a little further down the track. None are large positions yet but this office hums when good investments are available at attractive prices. The Fund continues to hold a cash weighting of around 15%. A 16% return is not to be sniffed at. 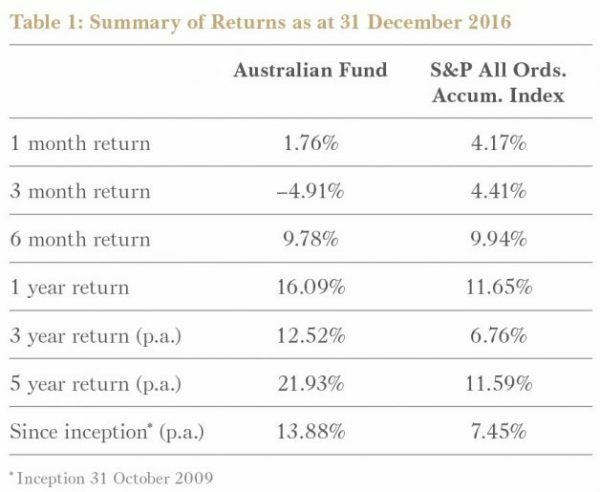 But 2016 could and probably should have been better for Australian Fund investors. In this quarterly report we discuss the biggest detractor from performance for the year, RNY. We also introduce two of the Australian Fund’s newest holdings, Cardno and NZME. Those who have managed the first few pages of Benjamin Graham’s Security Analysis might remember Horace’s quote. Those who have been around stock markets for a while won’t need Horace. For those newer to the game, mark the final quarter of 2016 as one where you learned a lesson that will hold you in good stead. 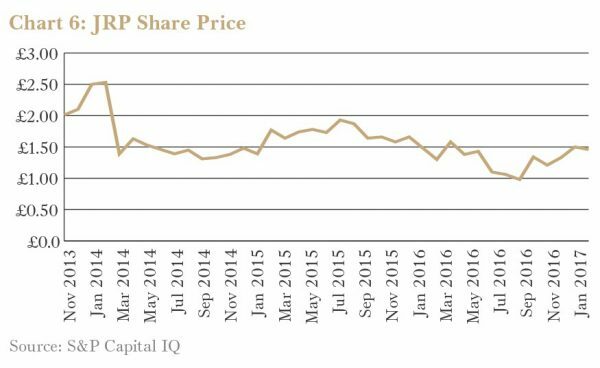 Priced to perfection growth stocks like Sirtex (SRX), TPG Telecom (TPM) and Bellamy’s (BAL) were stock market stars for the first nine months of the year. Many provided disappointing updates between September and December and their share prices were pummelled. At the other end of the spectrum, previously unloved, old, “ex growth” companies like the large banks and miners dragged the All Ords Accumulation Index up to a respectable 4.2% return. Investments can go up and down. Past Performance is not necessary indicative of future performance. The Forager Australian Shares Fund doesn’t own many high growth companies. Our holding in South32 benefitted from renewed market optimism towards the commodity space. But the final quarter of the year still had more than its fair share of travails. Some of the Fund’s best performers for the year experienced a healthy pullback in price. In the case of Service Stream (SSM), enough so to warrant an increase in portfolio weighting again. Elsewhere we suffered some serious blows to our estimate of value. 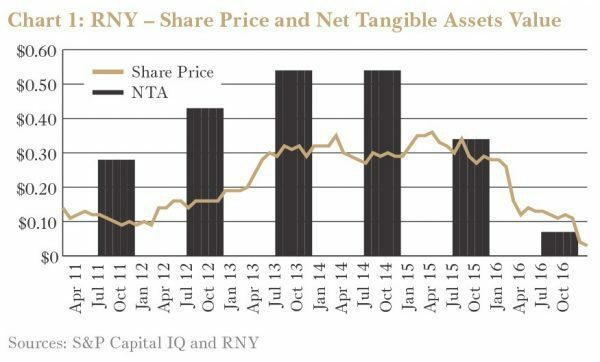 Most notably, RNY Property Trust’s (RNY) net tangible assets (NTA) deteriorated over the year as its manager, New York based RXR Realty, announced it was liquidating the Trust’s portfolio of office buildings (see below). While we are pleased with performance for the year, it could have been better. Although its stronger balance sheet has provided some protection, the operational performance of LogiCamms (LCM) has been worse. Many mining engineering companies benefitted from an upturn in commodity prices in 2016, including the Fund’s investments in GR Engineering (GNG) and MACA Limited (MLD). LogiCamms was one of the few that didn’t. The company produced terrible results for both the December 2015 half year and June 2016 full year, managed to further downgrade expectations for 2017 and proposed some outrageous resolutions at its annual meeting — most incredibly a resolution to award performance shares to management based on last year’s woeful results (the poor CEO is only on a half million dollar base salary). Fortunately, these resolutions were voted down by us and other shareholders. 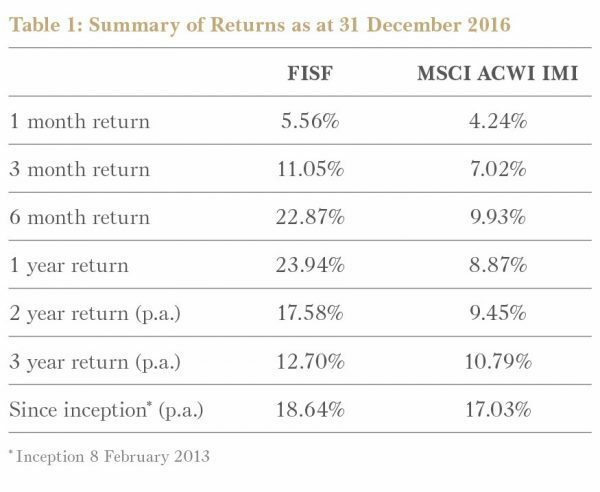 As the 16% return suggests, there were a number of strong performers during the year, including Service Stream, South32, Jumbo Interactive (JIN) and the aforementioned MACA and GR Engineering. With a few less disappointments, the year’s return could easily have had a two in front of it. It can take the market many years to recognise the value inherent in a business. We usually know whether our investment thesis has merit much earlier than that. The first year or so of owning a company usually highlights a few aspects of the investment that weren’t picked up in initial research. We get a better feel for management behaviour and we get more information about how a business fits into its ecosystem. Sometimes all of this confirms our initial thoughts. Sometimes it suggests we have something seriously wrong. RNY Property Trust is an exception to that generalisation. The stock has been in the portfolio for almost seven years. Four years into that ownership period, we were quietly confident of realising a return of between four and eight times the Fund’s initial investment. Today it seems we will be lucky to get half of our money back. At the end of 2014 the Trust’s reported Net Tangible Assets (NTA) was $0.54. Thanks to a falling Australian dollar and some deft debt restructuring, that was almost double the $0.28 reported in 2011. An improving US economy, falling unemployment and the prospect of more Australian dollar weakness had us thinking that its suburban office buildings were going to further increase in value. Those valuations were based on expectations about the future income the buildings would produce. Today, the assets are being sold, and we are getting estimates of what someone else is prepared to pay for them. Unfortunately, the gap between the two valuations is enormous. If the valuations based on bids received so far are applied to the whole portfolio, management estimates the final proceeds to unitholders would be between $0.04 and $0.10 per unit. That’s as much as 90% less than the NTA reported in 2014. The deterioration is as surprising as it is disappointing. There is not a lot we can do about it. Despite owning 40% of the assets, the manager, RXR Realty, doesn’t seem to have many ideas either. Unfortunately the assets are unwanted and the trust’s debt and lack of cashflow mean selling is the only option. Over the past few months the Fund has been buying shares in Cardno (CDD), an engineering consultancy company. Gerry Cardno and Harold Davies started the business in Brisbane in 1945. The company thrived during the post-war boom years through to the 1970s, designing bridges, sewage systems, dams and roads throughout Queensland. After listing on the ASX in 2004, Cardno expanded across Australia and internationally. A buoyant mining sector and 44 acquisitions saw revenue rise from $94m to $1.3bn over the period to 2014. By then it was valued at nearly $1.2bn, up from $35m when it floated. Then commodity prices slumped. Mining and oil related investment evaporated and there weren’t enough infrastructure projects to pick up the slack. Engineering firms competed fiercely for what work there was and the industry’s profitability crumbled. 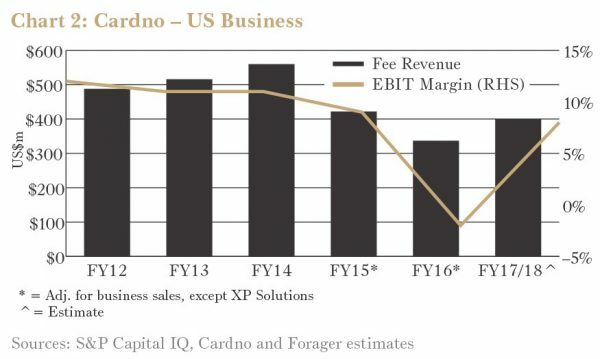 Cardno’s EBIT margin, a measure of its operating profitability as a percentage of net revenue, fell from around 15% in the boom years to less than 5% now. This shouldn’t have been a large problem. In a cyclical industry like Cardno’s, wild fluctuations in profitability are to be expected. But Cardno was carrying a lot of debt. In June 2015, gross debt stood at $400m (net debt was $320m), while the business had less than $700m in net tangible assets. Cardno operates mainly in Australia and the United States of America. The Australian business generated $347m in revenue or approximately 45% of the Group’s total in the 2016 financial year. Despite suffering from a fall in mining activity, operating profits fell only 10% to $37m thanks to the business’s strong competitive position within the environmental and engineering industries in Australia. This part of the business should be able to at least match this result over the coming years. In stark contrast, the American business, which accounts for nearly all the remaining fee revenue, is struggling. 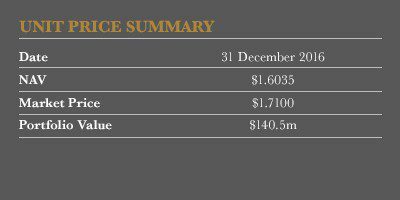 Fee revenue in the 2016 financial year was US$337m, down 20% from 2015, and the business made an operating loss of around US$4m. The large fall in oil and gas prices was only one of the reasons for this poor performance. In fact, government spending, which is usually countercyclical to private investment, was put on hold in the US due to the 2016 federal elections. And, if this wasn’t enough, Cardno’s complex organisational structure prevented its US managers from reacting to the change in market conditions. The recent decision of OPEC to restrict oil production (see above) should help the oil price edge higher. At the same time, many infrastructure projects are expected to be rolled out over the coming years under new-president Donald Trump. And Crescent has given more power to front line managers by simplifying the company’s organisational structure. An increase in fee revenue to US$400m and a margin of 8%, well below the historical 10%, would see the division earn US$32m in operating earnings (chart above). Importantly, this requires an improvement in the utilisation rate of the current workforce rather than additional investment. Source: S&P Capital IQ. Investments can go up and down. Past Performance is not necessarily indicative of future performance. The Australian media sector has wrecked the careers of many fund managers over the past decade. First were the growth investors — those prepared to pay high multiples for a business they think can grow. A decade ago high earnings multiples (around 20 times profit) were supposedly justified as deregulation was meant to lead to a wave of consolidation. Media moguls like the Packers, Stokeses and Murdochs were supposed to mop up the sector at premium prices. Fairfax (FXJ) was the most prized target, and APN News and Media (APN) wasn’t far behind. Unfortunately for the optimists, James Packer and Kerry Stokes shrewdly sold down their media holdings. Rupert Murdoch practically ignored his country of birth as News Corp (NWS) pursued pay-TV assets in Europe. Private equity were next in line for punishment. They emerged as the industry consolidators, using high levels of gearing to pay mind boggling prices for assets (in 2007, APN was the target of a bid by a private equity consortium that was blocked by a shareholder vote at $6.20 per share, a decision which cost them a lot. Perhaps they didn’t foresee the structural changes that were about to hit the industry. More likely they just didn’t anticipate how quickly change would come. Advertising dollars and classifieds revenue shifted online before the usual private equity tricks could be played. Then the value investors wandered into the briar bush. Once the dust settled, multiples came down to around 10 times profit. In a relative sense, this looked attractive compared to the market. But it turned out ten times next year’s profit is a lot to pay for a business that is rapidly going backwards. We have thus far managed to avoid the sector. And we still don’t think most valuations reflect the difficulties that lie ahead (particularly for free-to-air televisions stations). But we have made a recent foray into the media space with an investment in NZME (NZM). Primarily to address distressed balance sheets, media companies have been divesting assets. Unlocking shareholder value has been a very welcome by-product. You may see more on this front from Fairfax this year, with a potential divestment or demerger of its online real estate business Domain. But APN has been at the forefront of this trend, separately listing its outdoor business and selling its regional newspapers to News Corp. The Fund’s investment is its most recent. The newly created company is New Zealand Media and Entertainment, abbreviated to NZME . NZME is the spin-off of APN’s three New Zealand media brands, APN NZ newspapers, The Radio Network (TRN) and GrabOne. The result of the demerger is a company with a portfolio of print, radio and digital brands. A majority of print revenue is derived from the New Zealand Herald masthead. Most of NZME’s earnings are derived from radio and newspapers, with both holding appeal to us. The stable earnings of the radio segment make this a more valuable business than the other segments. It is arguably worth as much as the entire enterprise value alone. Some believe streaming services such as Pandora and Spotify will lead to radio’s demise. Although this remains a possibility as more cars are connected to the internet, advertising revenues from radio have held up remarkably well around the world. Radio remains one of the most effective ways for advertisers to corral a large audience. It also plays a social function, being a form of companionship as people listen to their favourite hosts. And perhaps above all, radio and streaming are complementary. For many listeners, radio is an important part of their streaming experience. Listeners tune in to radio to hear the newest releases and discover new music, which they then add to their music stream. The earnings from this part of the business almost justify the current valuation alone. And the newspapers are likely to be worth something meaningful. With a large percentage of New Zealand’s population located in Auckland, the New Zealand Herald is effectively a national newspaper, capturing a national readership and more importantly national advertising dollars. This makes it a valuable asset, particularly when compared to Fairfax’s Australian metropolitan mastheads, which are effectively large regional papers. Newspapers were the first to suffer revenue leakage to the internet. You should be under no illusion that the decline is coming to an end. But some national newspapers are showing that a subscription model can work. The New York Times, for example, is approaching the point where growing subscription revenues can offset declining advertising revenues. If any newspaper is going to survive, it will be a national masthead like the NZ Herald. Spinoffs often perform poorly early on. They may be too small to own for institutional investors with large-mid cap mandates. Or they may be too small for managers with billions in funds to obtain a material holding. Perhaps some Australian managers aren’t mandated to hold New Zealand stocks. 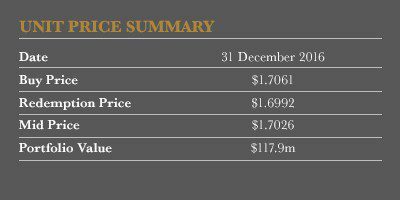 Whatever the reason, the sell down provided an opportunity to buy NZME at very cheap prices. And unlike most other media stocks, we don’t believe NZME will turn out to be a value trap. Unshackled from APN, the demerger has enabled management to focus on stripping costs out of the business. NZME and Fairfax are also in discussions to merge NZME with Fairfax’s New Zealand operations. The potential merger is subject to agreement by both boards and approval by the New Zealand Commerce Commission (NZCC). The NZCC has indicated its initial opposition to the deal, with a final decision due in the first quarter of 2017. There is a lot of potential upside in the form of further cost cuts but it is looking increasingly unlikely. That doesn’t change our view. As mentioned above, the radio assets underpin the current market capitalisation. And NZME should generate a lot of free cash flow for shareholders. Its net working capital requirement (receivables less payables) is close to zero. Capital expenditure required to maintain the business is low, running at about half of its depreciation and amortisation. This enables the board to have a dividend payout policy of 60–80% of profit. 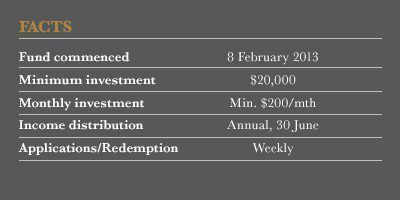 The midpoint of this range implies a dividend of NZ$0.08 per share, which equates to a dividend yield of 15% (fully imputed for New Zealand shareholders).